#SIMISAIALSOSG50: ARE SINGAPOREANS OVERDOING IT? 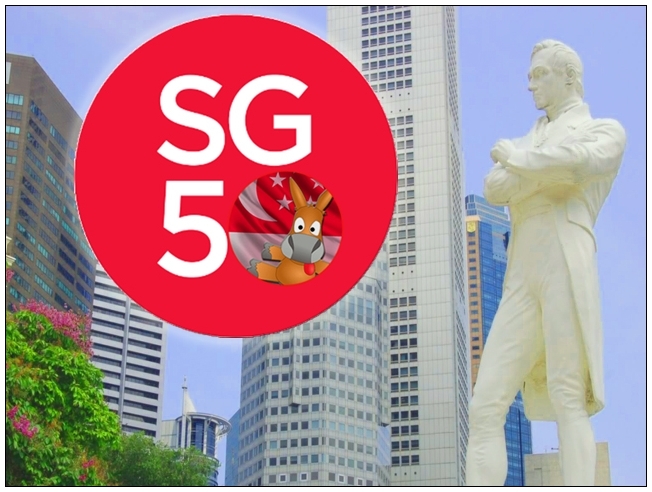 Our reader related to us how he spent his day off shopping and looking around the neighborhood, where he discovered that Singaporeans really do love their SG50 celebrations. Warning - SG50 LOLs ahead. For the uninitiated, the Singapore Armour formation do not have Malay soldiers since its inception in 1968 for unspoken reasons. The formation uses armoured vehicles such as tanks and armoured carriers to spearhead advance movements and hold key objectives during times of war. From what I heard from my enciks, there were discomfort in the region after the AMX-13 tanks were first revealed during National Day Parade in 1969 but it was a source of pride among Singaporeans and assuring for those who lived in the young nation. Our leaders then don't have a choice, Singapore was a punching bag and her survival was at stake. Anastasia Tjendri-Liew (b. 1947, Bangka Island, Indonesia - ) is the founder and managing director of Bengawan Solo, one of Singapore’s most successful bakery chains. Under her leadership, Bengawan Solo grew from a single store to a chain with over 40 outlets and a turnover of S$43 million in 2008. She took up Singapore citizenship after moving from Indonesia in 1970. People always praise Singapore for our economic strength, progress and foresight but little people know that besides the efforts of our pioneer generation, there is an Ang Moh who helped us make all of this possible. It is the Dutch economist Albert Winsemius who played a crucial role in the formulation of Singapore's national economic development strategy. I want to share about a member of our Malay community whom I believe is a good example and many youngsters in our community look up to him as their idol and role model. He paved the way for us to dream big and give us hope that nothing is impossible. He is MAJOR Yusri Abu Bakar the first Malay F-16 fighter pilot in the RSAF. Considering that only ONE in a thousand can make the cut to become a fighter pilot, he managed to overcome the odds stacked against him and show his ability to fly the war machine. After an incident where Indonesian commandos killed and mutilated the bodies of 9 men from 2SIR in Kota Tinggi, Daljit Singh and other troops were sent from Singapore into Malaysia to flush out these Indonesia commandos. It took Daljit Singh and other brave men three months to hunt down these saboteurs and in total, they killed or captured a total of around 60 Indonesian commandos. Daljit Singh alone was credited for single-handedly killing 6 or 7 enemy combatants during this operation in Kota Tinggi. Apart from his heroics, ASP Koh is fondly respected for his leadership philosophy and leading by example. During an interview, Koh said: "I believe a policeman’s life is very precious. If anyone has to die it should be me. A commander’s responsibility is to ensure that every person is accounted for and no unnecessary risk is taken". Honestly, how many of us can put the lives of others ahead of our own? With such brave and dedicated Commanders like ASP Koh within the Singapore Police Force in the past, it is little wonder why crime was swiftly brought under control during Singapore's turbulent years. It is these challenges that inspired me to write in and nominate this 74 year old Singaporean superwoman by the name of Indranee Elizabeth Nadisen for your SG50 Series. Not only does she have six children of her own, over the past 35 years, she fostered and cared for a total of 45 abandoned, abused or neglected children. Her selflessness and dedication to helping the under-privileged is beyond words. While these 45 fostered children were under her care, she treated them no differently from her own children. Food, food and more food. Singapore is the ultimate foodie's paradise and it is no wonder whenever visitors hit our Sunny shores, the first thing on their minds is Singaporean food. Chances are they have a bucket list of must try dishes and the Chilli Crab dish is THE local gastronomical experience stacked at the top of this list. Singaporeans may not be aware but the Chilli Crab has become a global ambassador of Singapore's food culture together with the likes of Chicken rice and Laksa. But behind the glamour of being Singapore's culinary poster boy, the Chilli Crab was borne out of the humblest of origins. It was not magically created in some five star restaurant but in one of the kampungs near the shores of East Coast during the 1950s when a lady named Cher Yam Tian tried to please her husband tastebuds during dinner time. Should leaders focus on results or people?